Would you like to be in London one minute and in New York the next one? With Webcam Saver, you can. Watch the pigeons at Trafalgar Square, switch to Venice Beach and see where a busy highway I-80 takes you. You don't have to buy airplane tickets to travel the world. 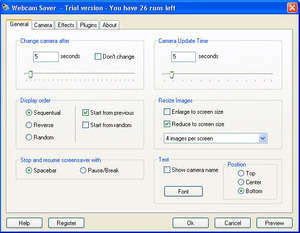 Webcam Saver 1.4.3.1 is a shareware program and can be used as a demo to try the software until the free trial period has ended. A full version of the program is available after the trial period ends. For security reasons, you should also check out the Webcam Saver download at LO4D.com which includes virus and malware tests. Additional screenshots of this application download may be available, too.